Big data is a term used increasingly to describe the use of large amounts of data gathered electronically to determine insights otherwise lost in the detail. It is often characterised as the 3 V’s, Volume ( e.g. terrabytes); Variety (e.g. social media insights as well as surveys) and Velocity (fast data transfer and processing). A famous early example was use of location-specific Google searches on flu medicine to predict and track the spread of a flu virus through America quicker than conventional methids. How can this principle help revision? Well, a subset of Big Data is simply “more data than usual” – big data light to coin a phrase – and I have done this with Maths past papers. 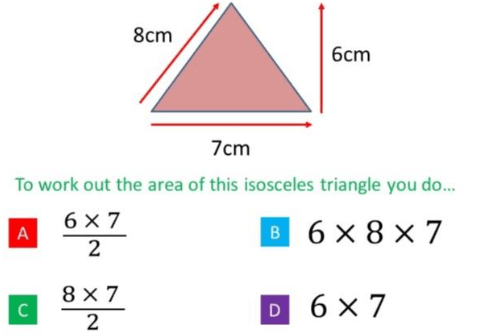 Not just answers and methods are available on line for all past papers – that is well known – but also examiners’ comments are available question by question. Initially I have looked in detail at 4 past papers, 100 questions, and captured the comments from each, 130 in all, for which the examiners highlighted common causes of lost marks from tens of thousands of entries. Then I grouped them and tallied them GCSE style in a frequency table and chart as seen left. This sheds light on general areas for revision, with (lack of) “basic maths skills” ferquently bemoaned by examiners, as well as subtle tips such as “read the question very carefully and make sure you show working”. Then, further I picked out twenty very specific examples of errors that seemed to occur – this time syallabus technical content rather than functional categories above – and wrote and illustrated a list of “20 things examiners do and don’t like to see”. A typical one is shown. I recently took some examiner marking training and I can assure you this is true. If a question asks you to “express a number as a product of its prime factors” then merely listing them, with commas, will lose you a mark, if the “times” sign is missed out. Even if the numbers are riight as above. – the twenty things examiners do and don’t want to see. With half time biscuits covering the Jack Black “school of rock” Math video. Another phrase used in the Big Data field is “wisdom of the crowds”. This is being applied superbly by the excellent on-line Maths tutor “MrBartonMaths” (he is also a real teacher). One of the blog pages he runs is “Diagnostic Questions – Guess the Misconception” where students are invited on-line to answer a multiple choice question and give their reason (a typical weekly question is shown). Typically around a thousand students vote (hence the “crowd”) and reveal what errors are often being made (in the example A is correct of course, C was the most common error). The misconceptions are both the students’ errors, and tutors’ sometimes incorrect expectations of what errors might be most frequent. A lot of data is available out there on-line – the key is to process and present it in the best way to understand and hence help students. This entry was posted in Maths and tagged Exam management on March 17, 2016 by Rick 1.